And on top of all that, we also offer beach towels, beach chairs, boogie boards, and sand toys! The Santa Fe. Room 108. Bringing New Mexico charm to southern California, The Santa Fe room is richly furnished with whitewashed oak and an ocean view. The French Country. Room 106. Modeled after a French country home, this room boasts of legacy and history while still maintaining an air of modernity. 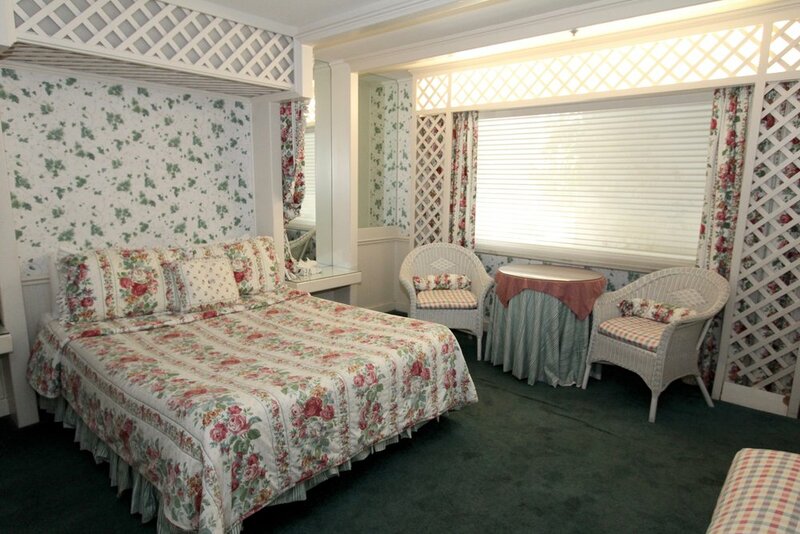 Enjoy the breath of fresh air and warm garden tones while staying in The Lattice, richly decorated with floral accents. 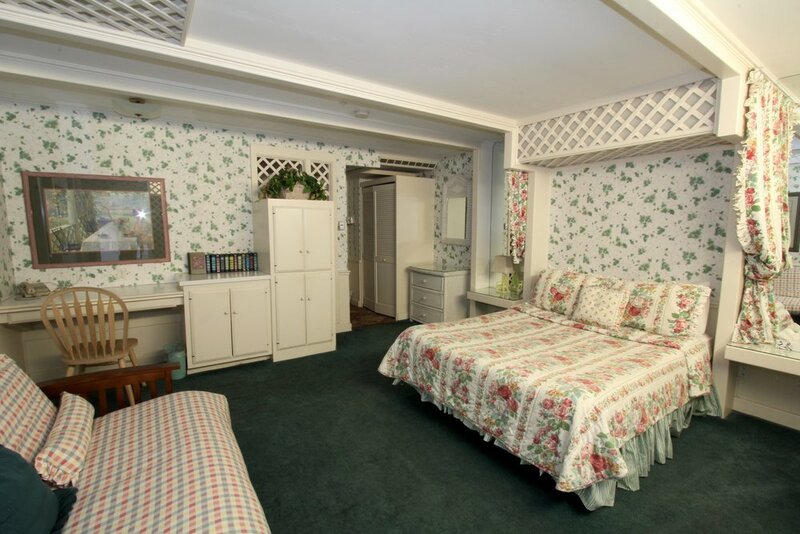 It also has a wonderful authentic brick floor that gives the feeling of being in a garden-like room! 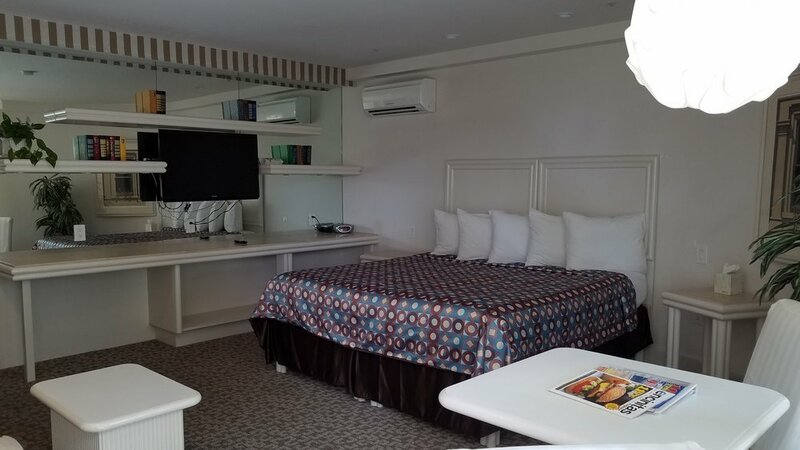 As one of the most spacious rooms at the hotel, it comes with floral wallpaper, lace curtains, and oceans views that will brighten anyone staying in such a lovely place. 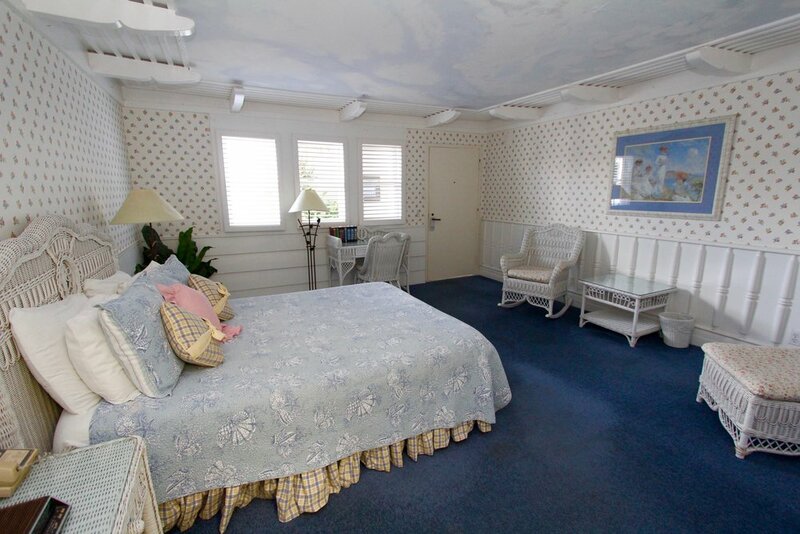 Named after our 32nd president, This Americana Room makes you feel right at home with a queen-sized sofa bed, a special curved, walk-in shower, and gorgeous ocean views. 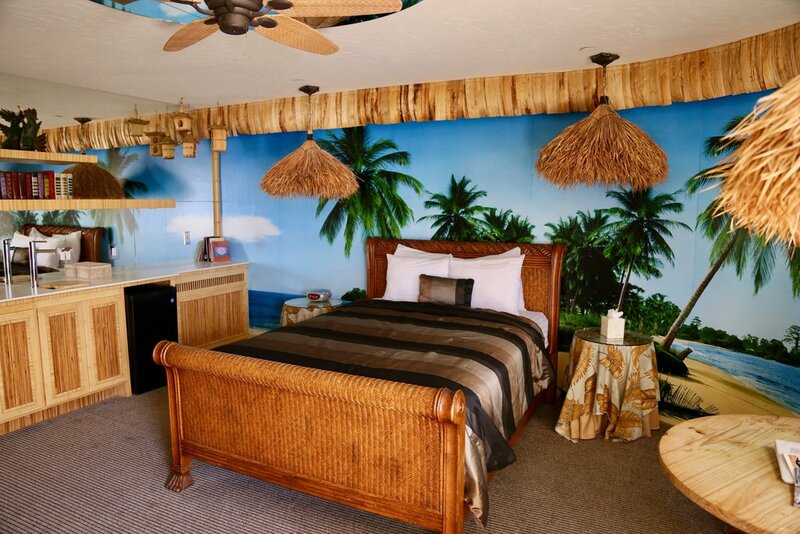 This room will have you feeling like you're taking part of a summer cool night all the time with a hand painted mural of peaceful skies as well as Shabby-Chic furnishings. 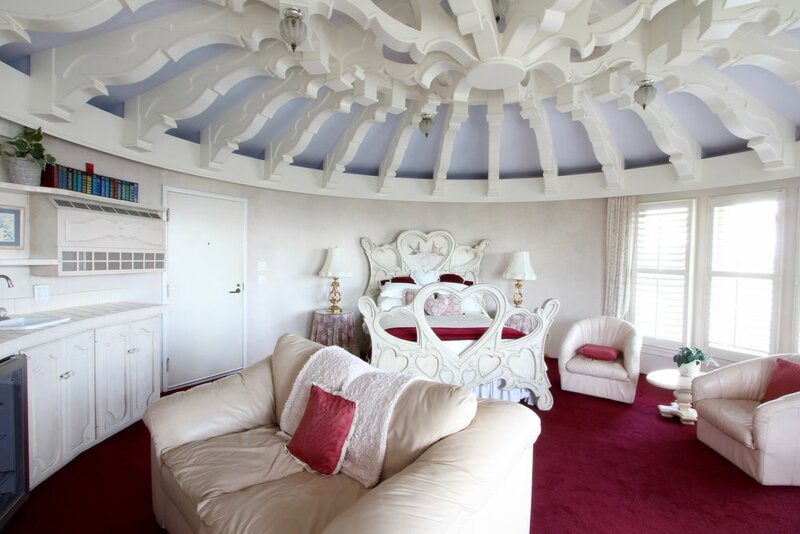 Angled Mirrors accent the room in a whimsical and conceptually artistic way while the oval shaped bed and in-room sofa allow for easier relaxing. 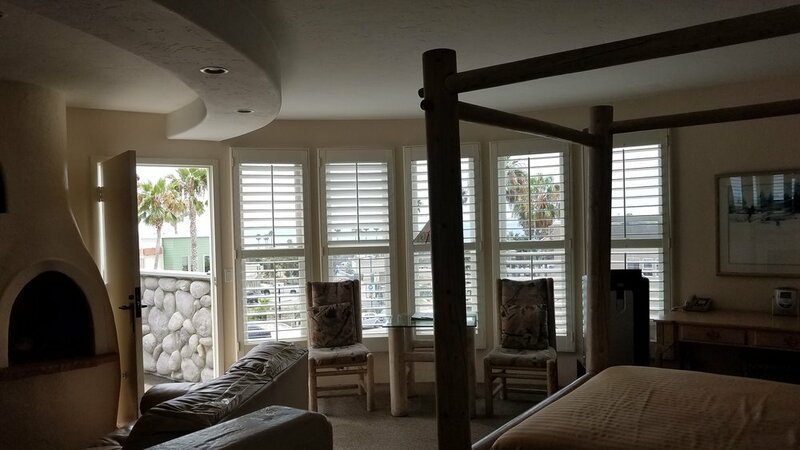 This room boasts a hand-carved bed etched-glass windows with spectacular ocean views and separate bathrooms, along with our heart-shaped tub and double-sided fireplace to curl up with your loved one after a relaxing day by the ocean. 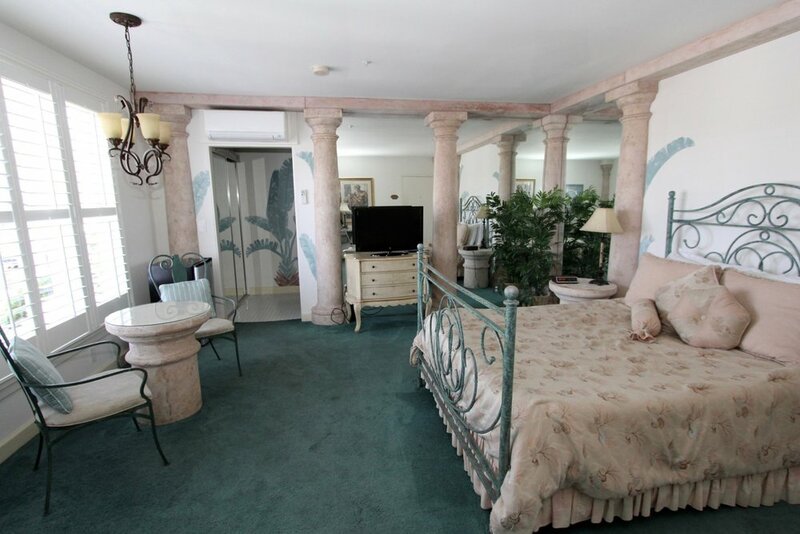 Our Paradise room will make you want to kick off your sandals after a relaxing day at the beach without ever having to leave it. 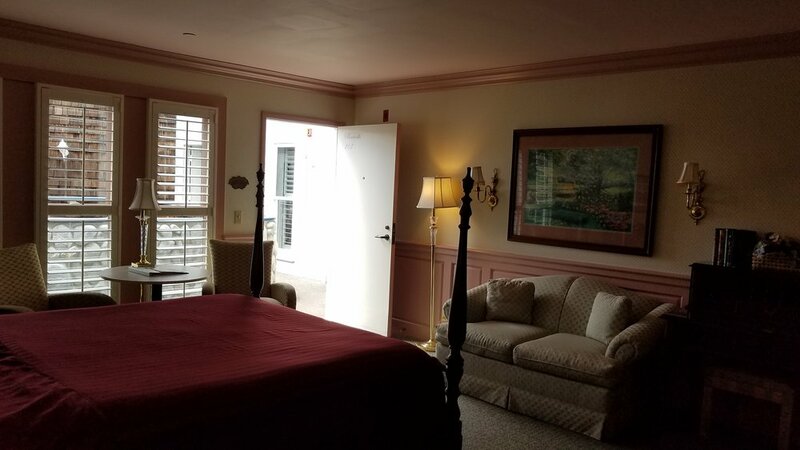 Named after the Founder of Cardiff-by-the-Sea, Frank Cullen, this room features turn-of-the-century accents, intricate dark wood furnishings, and is a subtle ode to Cullen and the time period in which he lived. The cultured stone columns and verde green scrolled iron furnishings an ancient Grecian charm while still sacrificing no sophistication. The French Garden. Room 103. 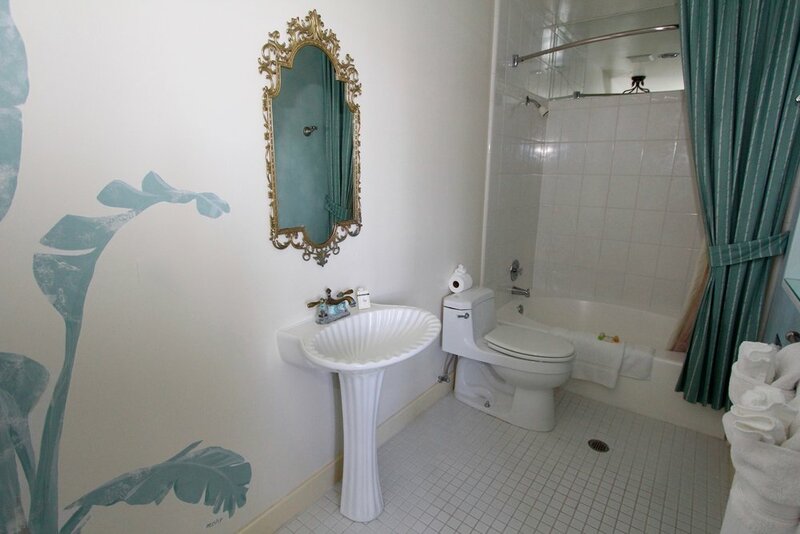 Wicker decor and brick wainscot, coupled with a lovely garden and fountain view and your very own whirlpool tub make this a guest favorite. The Garden View. Room 101. 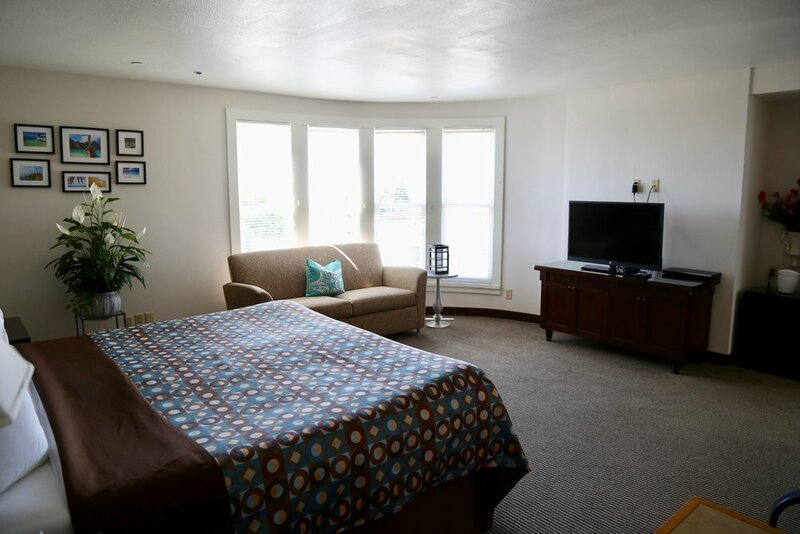 Take a load off and enjoy the wonderful Garden Views this room has to offer. 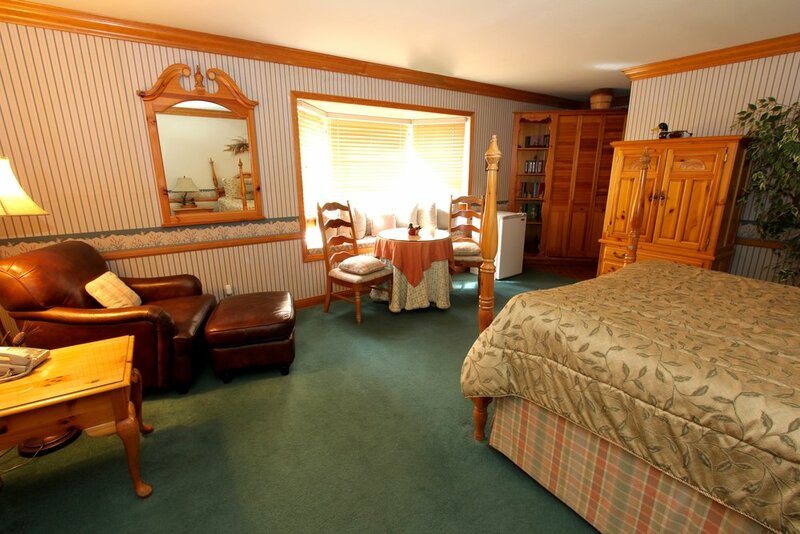 Along with the self explanatory name this room features a wet bar and an additional queen-sized sofa sleeper. 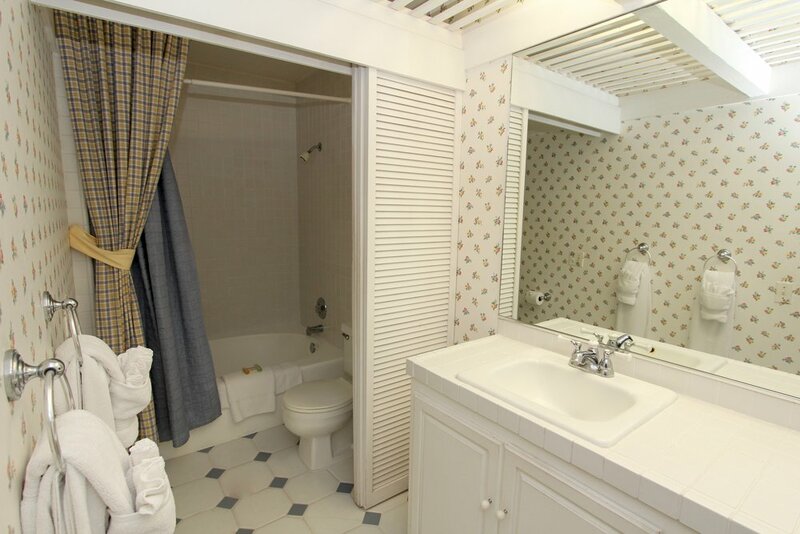 Styled after the mountaintop home of Thomas Jefferson, this room shines with dark cherrywood furniture, a marble accented bathroom, and a whirlpool tub for your own personal relaxation. 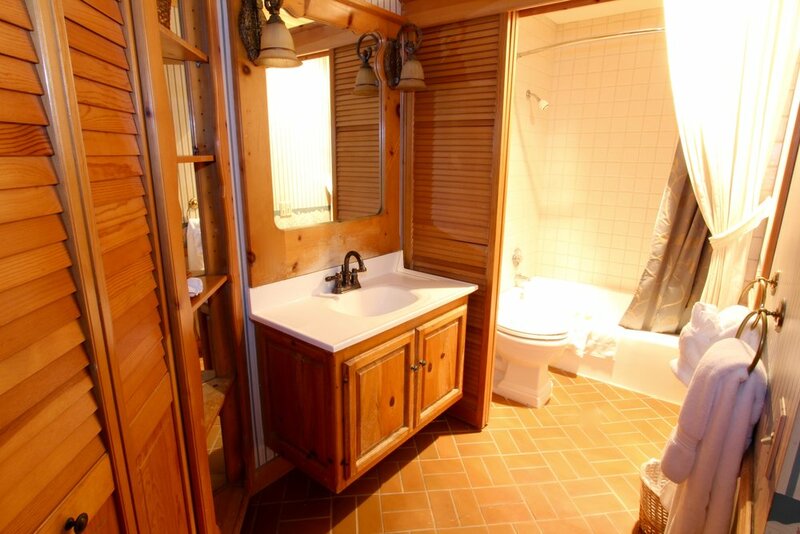 The Country Pine. Room 205. 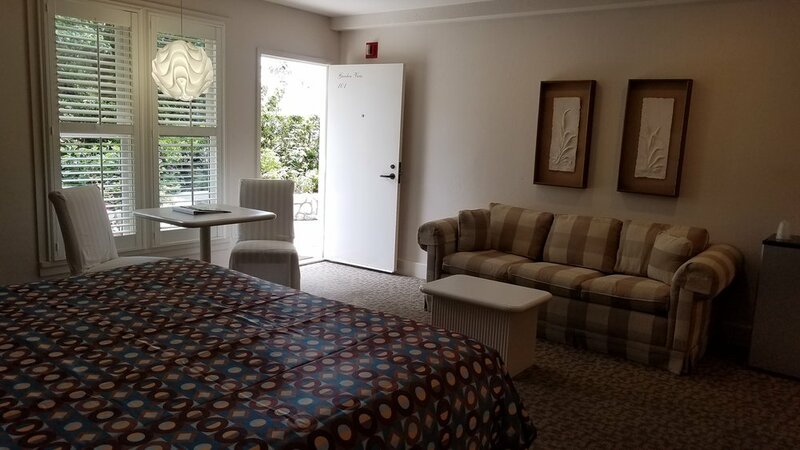 Get comfy in the good ol' charm of this rooms overstuffed armchair, the window seat overlooking the ocean, and all the modern amenities needed for a restful stay. 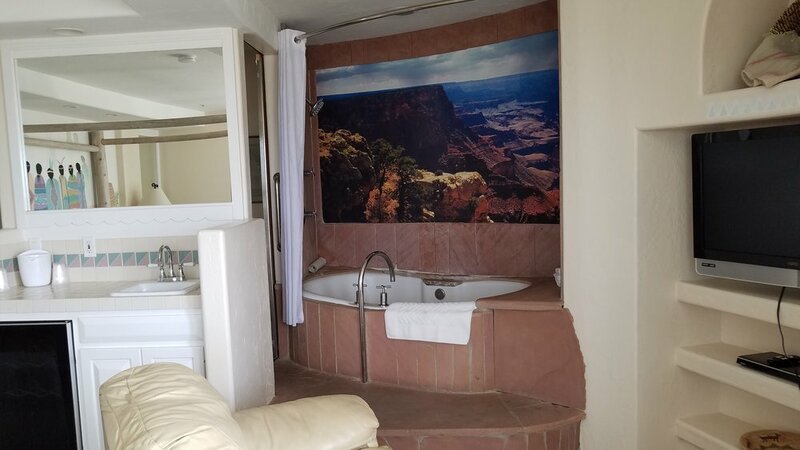 Traditional, Spanish-influenced style and south-of-the-border romantic give you the perfect escape into the canopied bed and adobe styled fireplace while enjoying the amenities of a twenty-first century home. Contemporary design, incredible view, and a king bed. 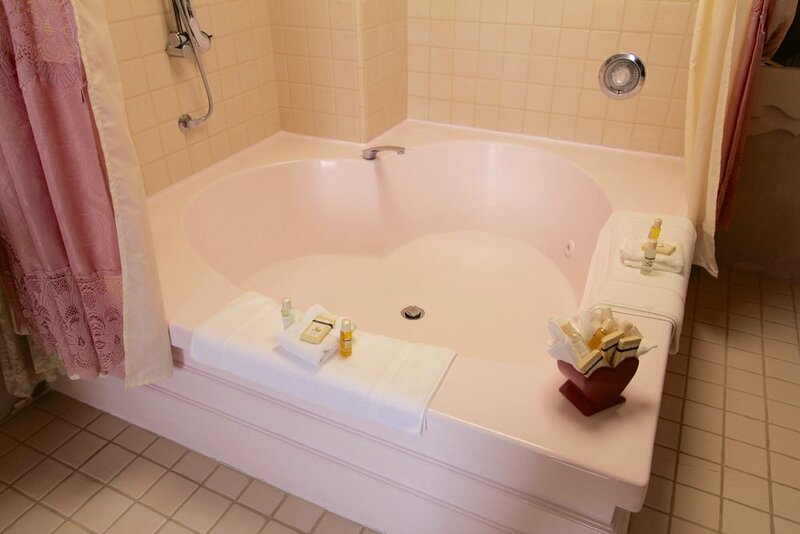 You're the captain of your journey when you're staying here!